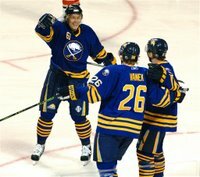 On the heels of their 9-1 drubbing of Philly tonight (note, that's a combined 16-2 win margin over their last two meetings going back to the playoffs), the Sabres improved to 6-0, picking up right where they left off last year. Sorry Dallas. Sorry Minnesota. You may be undefeated as well. But the Sabres were the best team in the playoffs last year until they were decimated by injuries. And they are still the best team in hockey this year. Period.